Think that craft beer is the only thing San Diego brews up in delicious quantities? Don’t overlook the area’s estimable coffee roasters. Or its very own makers of kombucha, that tangy bubbly beverage that is so good you’ll forget it’s made from fermented tea. Here are some of the finest hot and cold (non-beer) craft brews to check out. Surfers, soccer moms, and pretty much everyone else flock to this java mainstay for its seasonally-changing selection, harvested at the ideal time. The motto here is “Farm to Cup;” their coffee is fair trade. The owners say they work with coffee farmers to incorporate practices that promote sustainability, such as rainforest preservation. An O’side favorite! Revolution Roasters takes pride in roasting their beans in small batches in a gas-fired roasting machine called a Probat L12. It’s clear these folks take their coffee seriously. Nitro tap cold brew is just one of the things that have helped the reputation of this coffee shop—which roasts its beans in-house daily—spread beyond its locations in Normal Heights, North Park, and Golden Hill. There’s a reason that this homegrown coffee roaster (which toasts its beans in Vista) has been able to open locations in Point Loma, Hillcrest, Encinitas, Mission Beach, Pacific Beach, San Marcos, and Fashion Valley—people love their coffee and extras, like the three-seed avocado toast, acai bowls, and Iced Gibraltars (a concoction made of espresso shots and simple syrup with a side of milk). Puerto Rico-born Banana Dang put down roots in Oceanside in 2015. They bring their eponymous banana-heavy smoothies, espresso drinks, and gourmet toasts—of which one option has mango, cream cheese, and cayenne; another has almond butter, chocolate, and honey. 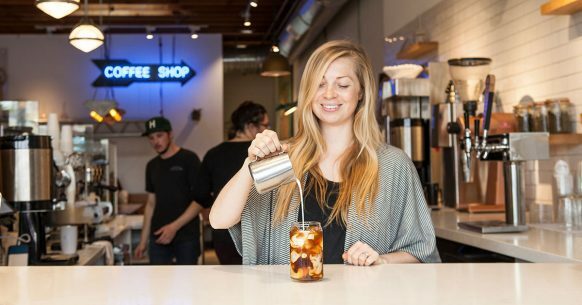 Combine a great food experience with kombucha by going to a restaurant that has it on tap. San Diego-based Living Tea’s kombuchas can be found at 70 locations in the region, as well as its own tasting rooms in Oceanside and North Park. In this beer-loving town, Boochcraft’s 7-percent alcohol kombucha is a craft beer competitor both because of its strength and its quaffable nature. Boochcraft comes in flavors familiar to fans of low-alcohol kombucha (like apple, lime, and jasmine; or ginger, lime, and rosehips) but has the depth and complexity of great beer or wine. Who says only beer breweries can have tasting rooms? Not the makers of this small batch, organic kombucha. In addition to a wide distribution net of their bottled offerings—in flavors like Pear Ginger, Cherry Oak, and Pomegranate—they also have a combined brewery and tasting room on Pacific Highway. “Chef crafted” is the slogan that these kombucha purveyors use to describe their flavors, such as Mango Masala (with turmeric and ginger), Hibiscus Rose (with rose blossoms), Sicilian Sunrise (with orange, fennel pollen, and anise). Their bottled San Diego-made elixirs can be found widely throughout southern California. This entry was posted in Culinary and tagged culinary by San Diego Magazine. Bookmark the permalink.